I'm a student at a University with an installation of Zotero which badgers me constantly about updates it can't install because of insufficient priveleges. The developers had the foresight to even include this in the error message; they realise that their users won't always have the ability to update the software. Yet, I still get badgered to update. If you realise that I can't do anything about it (ITS staff don't like updating software unless we have a reason) then why not just leave us alone? Zotero does not need the administrator privileges. You can click next (or close window with admin login) to continue in installation. Yes, the automatical installation does not work. 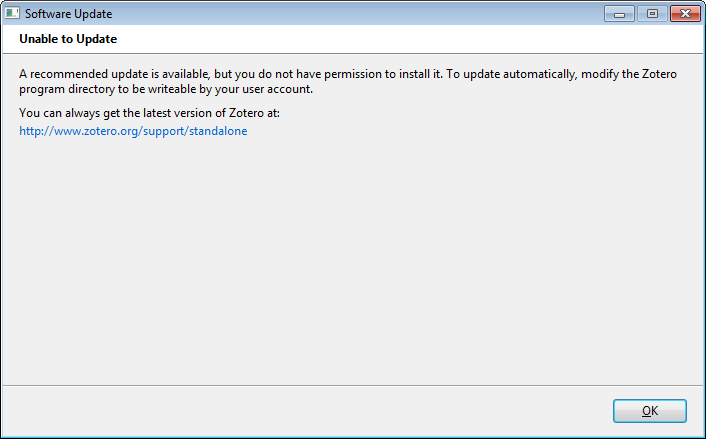 But you can download Zotero manually and install it without administrator privileges. That didn't go well. Not only did it leave the old Zotero installation (called Zotero Standalone), it gave me some shortcuts to just "Zotero" (no Standalone; presumably Zotero has changed the name for version 5.0) and the executable that those shortcuts point to cannot be found (Windows offers to delete them). Whatever the installation did after I declined to give Administrator credentials, something didn't work. It would be better if Zotero just didn't bother trying to bypass privelege restrictions and also didn't badger unpriveleged users about updating. Currently, exist only one version of Zotero. Do you see Zotero in the Start menu? There was a Zotero shortcut on the Start menu; however, when Windows suggested deleting it because it couldn't find what the shortcut pointed to, I said yes. The version 4.0 of Zotero was called Zotero Standalone to differentiate it from the web browser plugin which it started its development as. 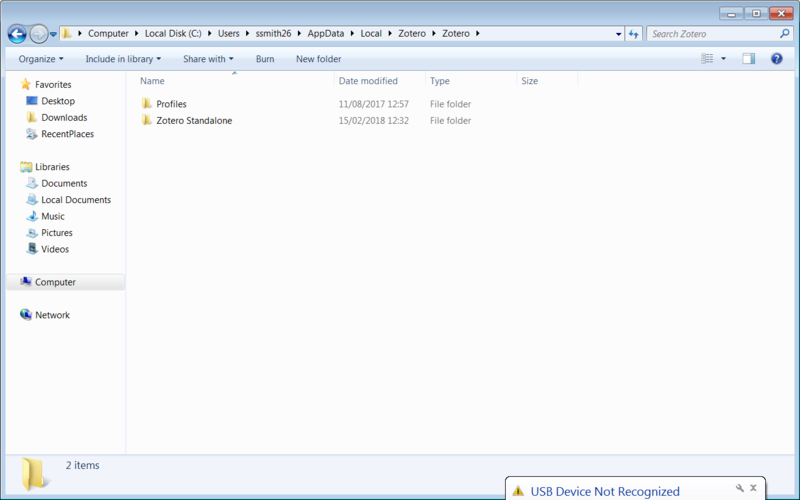 There is no Zotero.exe in this folder; perhaps the ITS department set Windows up to prevent people from installing software without authorisation. What LiborA is referring to is that in a standard Windows set-up you can indeed install Zotero as a non admin user -- but obviously this is something that an IT department can prevent if they want to. I'm also pretty sure that doesn't work well if you have a previous admin install. Zotero isn't trying to "bypass" anything in that process; it just checks whether you're admin and then installs globally and otherwise installs just into the local profile (but again, this is really moot here since it's not working in your set-up). 3) We are quite interested in getting people off old versions of Zotero. For example, we can't update fields and item types as long as versions of Zotero 4 are still syncing to Zotero, so they'll eventually (and that's sooner rather than later here) be cut off. If this gives IT staff a reason to update software, I'd call that an intended side-effect.